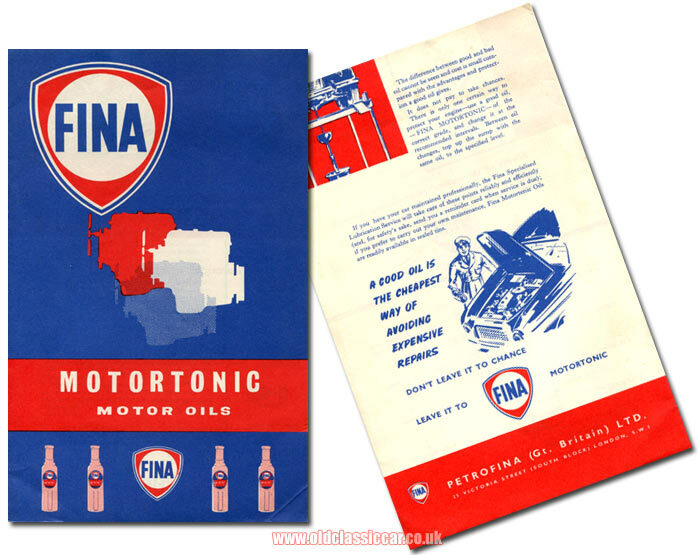 Fina Motortonic motor oils in the 1950s. Homepage. This page: Motortonic motor oils, produced by Petrofina (Great Britain) Limited in the 1950s. Although un-dated I think this leaflet for Fina Motortonic motor oils dates to 1960 or thereabouts. Fina - or Petrofina to give it its full name - isn't a name I've seen at a garage in many years, but the Fina name lives on and is still associated with lubricants and other similar products. The front cover features a couple of illustrations of overhead valve engines, while on the rear there is an Austin A35 on a ramp undergoing an oil change, while below a beaming garage attendant clutches a bottle of Motortonic, advising "A good oil is the cheapest way of avoiding expensive repair bills". 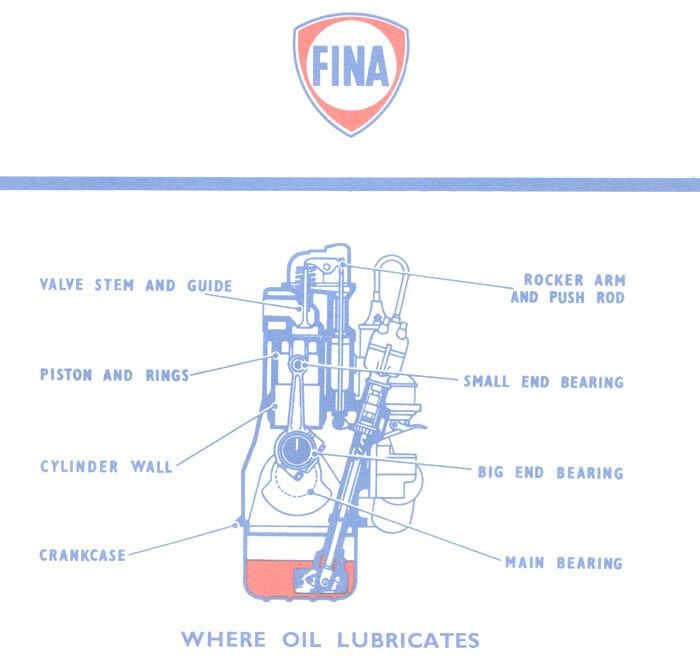 Presumably this uniformed chap is part of the Fina Specialised Lubrication Service which a reference is made to. Turn to page 1 inside the leaflet and the benefits of Motortonic are explained to the motorist or mechanic reader. The leaflet goes on to discuss friction reduction in the engine by the use of suitable oils, and introduces the subject of oil viscosity. Motortonic motor oils cover all viscosities. The viscosity, or "body" of a motor oil is denoted by the S.A.E. number system, originally introduced by the Society of Automotive Engineers in the U.S.A. as an arbitrary classification of oils and now accepted universally. The numbers are based on the viscosity at specified temperatures and a high figure (eg S.A.E. 40) has a greater viscosity, or more "body", while S.A.E. 10W indicates a lower viscosity or less "body". Oils increase in viscosity as the temperature falls, so the tendency is to use "thinner" oils in cold climates. Multigrade oils vary less in viscosity with temperature changes, however, and are thus capable of giving a more consistent performance between summer and winter - and also between hot and cold engines - thereby giving easier starting in low temperatures. The following paragraphs continue with descriptions on how the Fina lubricants provide a film of oil on the engine's internals, in order that the engine doesn't run dry for a few moments at cold start-up. The cooling properties of oil, for instance in the area of the valve gear, are also discussed at some length, as are the detergents included within the blend to harness contaminants, and also deter the formation of gummy deposits within the engine. How long Motortonic was on the market for I've not yet been able to establish, I've seen photographs of oil bottles that date to the 1950s and 1960s which tally with the approximate age of this leaflet. Fina put its name to many different motorist's products, including an anti-freeze that went by the name of Fina Thermidor.